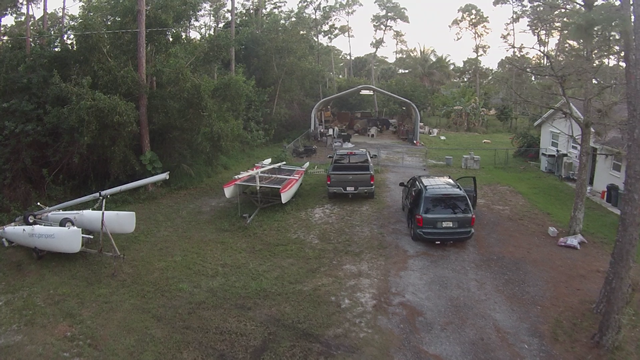 The Man Shed was built to provide cover for boat build projects beginning with TMS-20 a Kurt Hughes designed Trimaran Sailboat. I looked at the stock plans and had Kurt redesign the stock plan "Spitfire" with my requested changes. We designed a flair in the main hull above the water line to add more room in the cockpit area without increasing the wetted surface, the deck was flattened, and more free board & beam added to the Ama's. One thing that puts me off on trimaran designs in general was the boxy look and the, "they all look the same aspect". This design is a set of flowing curves from the bilge to deck, bow to stern. I wanted was a light, fast, and comfortable speed machine. I liked the idea of sitting down low in the 20' hull, 6 inches above the waterline, looking up at a 31' mast, and 17' wide for a thrilling ride. The construction is Divinycell foam and vacuum bagged carbon fiber cloth with West Systems Epoxy. The TMS-20 is a break-away from what is out there on the market today. Most small 20 foot range or less sized tris are more for putzing about on the water. I feel this will be a speed machine giving you a real seat of the pants thrill. It does not follow the traditional boxy designs and will be an option for the sailor that wants to go out and mix things up in a beachable Trimaran. Work has stopped on the TMS-20 due to time constraints the last two year, this is still a part time project work will resume in late 2015 or early 2016. Two Catamaran sailboats a Super Cat 20, G-Cat 5.7 meter are under restoration and refit. The design and build of a motorized floating lounge chair with built in beverage coolers. Designed for coastal use with fiberglass hulls and aluminum tubing. 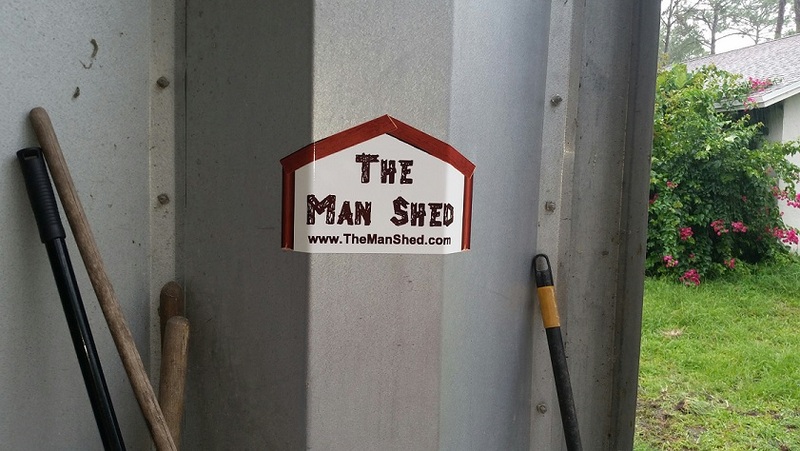 Visit the photo gallery and pages to see what is is under roof at The Man Shed. TheTMS-20 is a Kurt Hughes design. I looked at the stock plans and had Kurt redesign the stock plan "Spitfire" with my requested changes. I had a flair designed in the main hull above the water line to add more room in the cockpit area without increasing the wetted surface, the deck was flattened, and more freeboard & beam added to the Ama's. One thing that had put me off on trimaran designs in general was the boxy look and the, "they all look the same aspect". This design is a set of flowing curves from the bilge to deck, bow to stern. Want I wanted was a light, fast, and comfortable speed machine. I liked the idea of sitting down low in the 20' hull, 6 inches above the waterline, looking up at a 31' mast, and 17' wide for a thrilling ride. The construction is Divinycell foam and vacuum bagged carbon fiber cloth with West Systems Epoxy. TheTMS-20 is a break-away from what is out there on the market today. Most small 20 foot range or less sized tris are more for putzing about on the water. I feel this will be a speed machine giving you real seat of the pants thrill. It does not follow the traditional boxy designs and will be an option for the sailor that wants to go out and mix thing up in a beachable Trimaran. Currently work has stopped on theTMS-20 due to time and money constraints hopefully work will resume in late 2015 or early 2016. But there are many current project under way in The Man Shed.